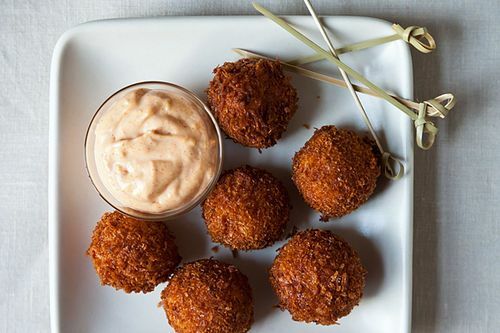 Congratulations to Sonali aka the Foodie Physician, whose Serrano Ham and Manchego Croquetas with Smoked Pimentón Aioli won this week's contest for Your Best One-Bite Party Snack! My parents are both incredible cooks. Growing up, they both worked full time but somehow, almost every night, they would find the time to cook dinner together. My sister and I would pitch in and then we would all sit down to eat together. The kitchen was always the center of the house, the place where everyone gathered. I ate mainly Indian food growing up but my parents love to travel and exposed us to many different cuisines, always with a focus on fresh ingredients. I continue that tradition to this day on my blog where I focus on nutritious, tasty food with lots of flavor. I do like to splurge on occasion though because I love food and always want to try new dishes, so I believe in eating in moderation. There aren’t too many things I don’t like however I have to say that I’ve never really liked white chocolate. It’s so hard to choose, I’ve been cooking up a storm lately! A few things that come to mind are sweet potato gnocchi with brown butter and sage, red wine braised short ribs with celery root puree, Chesapeake Bay crab cakes with mango salsa and Sriracha aioli, and balsamic glazed baby back ribs. A couple of years ago, I competed in the Sutter Home Build a Better Burger competition which was filmed by the Food Network. My burger had fried onion rings on it and I had to deep fry the onions on an outdoor grill. I had a hot oil thermometer in the oil but it wasn’t heating up fast enough so I closed the lid of the grill. A couple of minutes later, I noticed black smoke billowing out- turns out the rubber handle of the thermometer had melted off and caught on fire! When the Food Network cameramen saw the commotion, they came running over to see what was going on but fortunately, I extinguished it before they could catch any of it on film! A couple of different things- I’ve always loved pasta and would have to choose either macaroni and cheese or spaghetti carbonara with a poached egg on top. Also my mom’s food, especially her rice and kadhi, which is a spiced yogurt sauce. Growing up, she would always make that for me and my sister when we were sick so I guess that’s why it’s a comfort food for me. No apron -- I just never got into the habit of wearing one, although I probably should! The scene in Spanglish where Adam Sandler, who plays a chef, makes an egg sandwich after an exhausting day at work. The dish is so simple (basically a BLT with an egg and cheese) yet it looks so delicious and who doesn’t love a runny egg on anything! The best part is that in the bonus features on the DVD, they show famed French Laundry Chef Thomas Keller coaching Sandler on the scene, teaching him how a professional chef would prepare the sandwich to make the scene look authentic. I was in culinary school when I saw the movie and found that part fascinating. My husband -- he’s my culinary muse and my biggest fan. Plus, he always loves everything I make! c; alone when I’m trying to cook a quick meal and I’m pressed for time; with others when I’m hanging out with good friends or family. a and c; I try to clean as I cook so that I don’t leave the kitchen a total mess but usually my husband does the final cleanup. Thanks so much for all of the nice comments! Congratulations - those look like the perfect mouthful....and chic too :-). Congratulations!!! It was fun to read your profile. Medicine and fresh healthy food all healing properties in life, especially the made with LOVE part. Congratulations! I agree with you and Midge. White Chocolate's not my thing, either. Congratulations! Didn't make the burger show / Food52 connection until now ... so you are a doctor, a chef, and a TV star! That's amazing!!! Congrats Sonali! I'm with you on white chocolate. 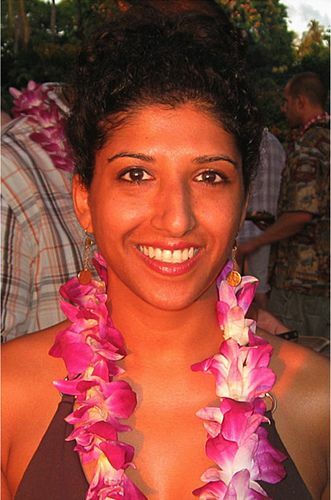 Congrats, Sonali! Great Q&A. Can't wait to try your croquetas. Thanks so much! Let me know how it goes if you try the recipe!